The way we design our environments matters more than ever, and in the Interior Design program at Columbus College of Art & Design, you’ll find the facilities, tools, and faculty to make your design dreams reality. 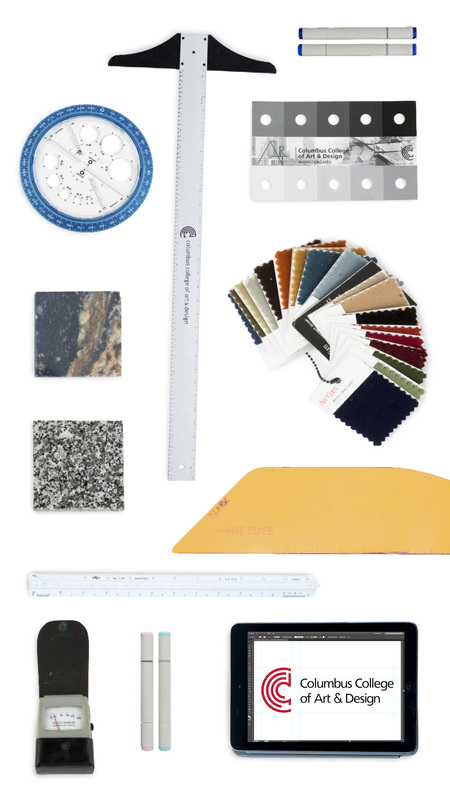 Thanks to an emphasis on real-world applications, the Interior Design curriculum prepares you for jobs and internships by arming you with the know-how to present your work professionally. You’ll learn AutoCAD, Photoshop, Revit, and SketchUp Pro for renderings and InDesign for project presentations. "As a student, it helps to understand what professionals are expecting and how to create work at that level," says Tara Kursinsky (Class of 2019). "This is what the pros are using, so these computer skills are definitely a requirement if you want to be successful in the industry." Want to crush it in the real world? You’ll want to take a variety of classes. Business classes are a must for any budding entrepreneur, photography comes in handy for project work — if you can take photos yourself, you don’t have to hire someone else to capture your vision — and graphic design offers you the tools needed to cultivate your personal brand. Plus, you can learn how to create a beautiful website and show yourself off to the professional world. You’ll dive into design quickly your first year with projects like Intro to Design, which features an emphasis on professional presentation skills, and Collaboration in Design, which teaches you how to work together. (Designers rarely work alone. Squad goals.) From the beginning, you’ll learn how to ask the questions that might uncover solutions and solve big problems. Like an architect, you’ll learn how to identify what a client needs to create a comfortable, engaging, and appropriate space. Those skills are a priority. Design is all about making the world a better place, and by questioning how spaces, products, and buildings can serve a better function, or be more beautiful and useful, you’ll be solving problems — not just designing for design’s sake. You’ll learn how — and why — to make the right design choices, which is key to creating user-friendly, sustainable, and human-centered design. And once you understand how things are assembled and constructed, you’ll make better decisions as a designer. From footer to roof and everything in between, hands-on building construction classes take away the mystery behind the drywall, while sustainability and user-experience courses ensure that you consider the human factor first. In short, you’ll have a direct impact on people. When Kelly DeVore discovered smaller-scale projects encompassing interior design and branding, like creating materials and spaces for wineries — including one named Coolest Wine Label by Seattle magazine — she found her calling. DeVore teaches interior design studio and advertising and graphic design concepts at CCAD and believes that by considering light, sound, texture, and the environment of a space, designers impact the human experience. Joel Gundlach won the 2016 CCAD Outstanding Faculty Award. He has taught Industrial Design and Interior Design classes for more than two decades, and he enjoys helping students construct well-thought-out places. A freelance furniture designer, Gundlach’s clients include the Columbus Foundation and Columbus Museum of Art. I’m designing residential spaces for DEV, which I own with my husband. I also am passionate about social practice research and present at conferences as much as I can. I love all the volunteer opportunities there are in Columbus — the community really cares! I love heading outside with my dog and family — or you might find me wandering around at a farmers market. Much of my practice is designing and fabricating custom furniture and cabinetry. As a maker, I love all the resources and shops that are available. You can get just about anything here. I love being on the water in one of our old restored wooden boats.